Last weekend we visited Soul Food Farm in Vacaville with our friends Jim and Anita. Soul Food Farm supplies eggs for Chez Panisse Restaurant in Berkeley. If you're not familiar with Alice Waters, she founded Chez Panisse Restaurant in 1971 with the philosophy that the best-tasting food is organically and locally grown. We stopped at Soul Food Farm to buy fresh eggs and support the local farmers. They have seven different breeds of laying hens that commingle on the farm in Vacaville. The chickens have a good life, they roam acres of beautiful pasture every day, foraging for bugs and laying eggs. 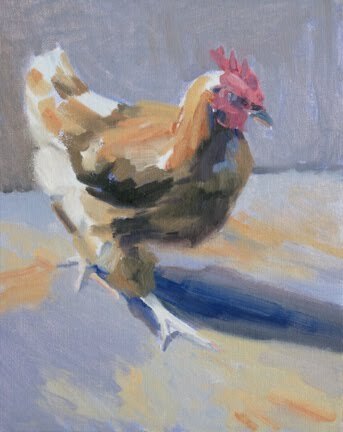 I decided to take photos and paint chickens. The color of the hens are variations of earth tones, browns, rust, oranges and black. Above is a painting of one of the hens, strutting around the field. As unusual as it may seem, a VW van in front of a Victorian house is a common image in beach communities of California. The Pacific Ocean seems to attract these classic vehicles. For five decades they've been hauling surfers and their gear to the beach. Just as the shoreline attracts people today, much of the Victorian building boom occurred in coastal communities in the early 1900s. 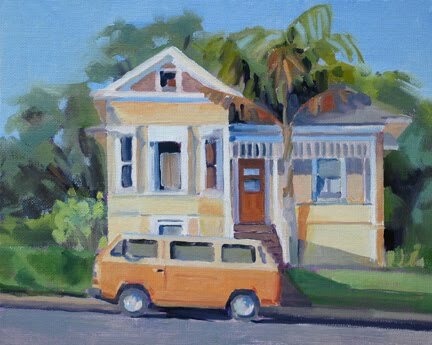 I was attracted to this yellow house on Broadway Street by the queen palm tree. The queen palm is ubiquitous in California beach communities from Southern California to Santa Cruz, but rare on the Peninsula. It's a soft flowing graceful palm tree, whose undulations in the wind, seem to mimic the surf nearby. Fogarty Vineyards and Winery is located high in the Santa Cruz Mountains overlooking Silicon Valley. 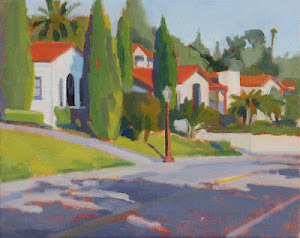 As you enter the winery, off to the right you will see the Portola Springs Vineyard, which is the view captured in my painting. The Portola Springs Vineyard is the steepest and most extreme site on the property. The vineyard produces the grapes for the Fogarty Chardonnay wines. 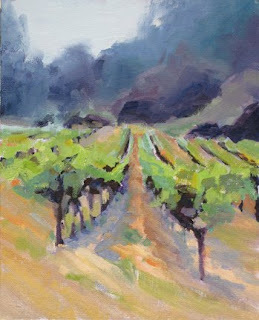 When I created the painting, the vines were leafing out, but the grapes were immature. The grass between the rows was beginning to turn a golden color. The shale and sandstone soil conditions and extreme exposure, lead to some of the most unique and intriguing wines made at Fogarty Vineyards and Winery. The winery was established as a commercial venture in 1981 by Dr. Thomas Fogarty, Professor of Surgery at Stanford University Medical Center. While working as a surgeon Dr. Fogarty helped a colleague with winemaking. His interest blossomed and he later purchased acreage in the Santa Cruz Mountains and planted his first vines in 1978. The estate now consists of 325 acres, 25 of which are under vine. 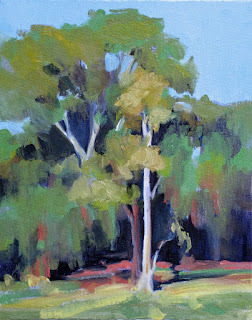 The variety of colors in Eucalpytus trees make them interesting to paint. The Eucalpytus tree in my painting, has a light gray-brown colored trunk with red, yellow and blue tones in the peeling bark. The immature leaves are rounded in shape and a cool blue color, while the mature leaves are elongated and a warm green tone. As the leaves age they change to a translucent red-orange color. Nature creates all the beautiful color, I just have to be observant. I do not like to paint in the fog, but the colors of the sky and ocean are beautiful variations of gray. I painted "Fog at Pebble Beach" while I was attending a plein air workshop. The fog didn't lift all day. The ocean was a calm, steel-blue gray, which contrasted with the hot pink ice plant on the cliffs. 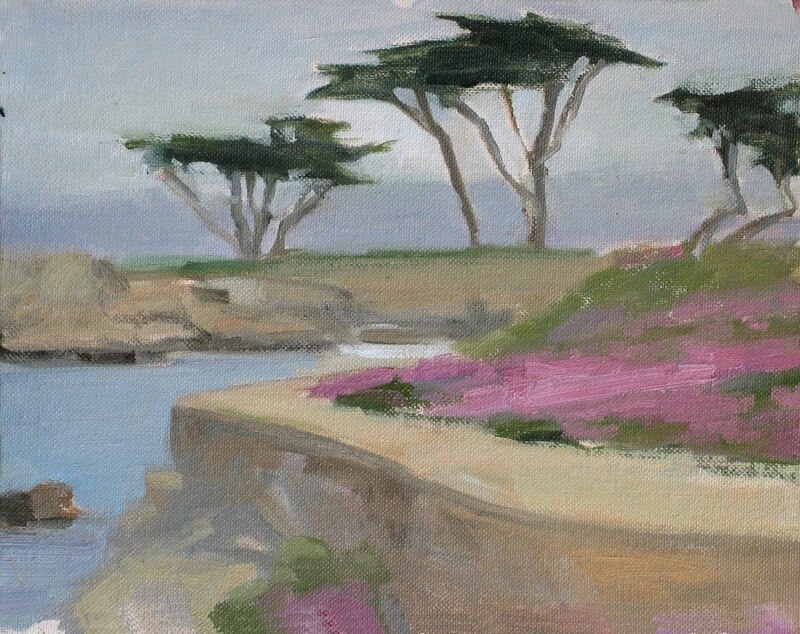 In the background are the distinctive Cypress Trees that line 17-Mile Drive in Pebble Beach.